Can the Web save the Big 3 automobile companies? Probably not, but making Web-friendly vehicles could help to sell a few more cars. Tech companies have increasingly been showcasing web applications for automobiles. Microsoft was working with Hyundai on making an in-car computing system and OnStar may be incorporating Twitter into its vehicle systems. Now Ford will be allowing owners of the Ford F-150, Super Duty, E-Series and Transit Connect trucks and vans to access the web from their vehicles through the Opera mobile browser. Opera will be the featured browser on Ford’s first broadband-capable, in-dash computer. 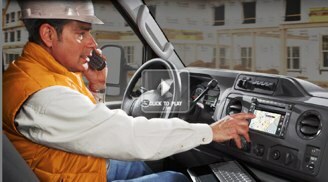 Ford is purposely installing these computers in trucks and vans to appeal to contractors, farmers, and construction workers to turn these cars into “mobile offices.” Truck owners will be able to use the in-dash browser to access sales information, contact databases, job-site plans, inventory lists, calendars, e-mail, or even the weather. The Ford Work Solutions in-dash computer is integrated into the vehicle’s center stack, filling the same space normally occupied by the standard radio. It is equipped with a 6.5-inch, high-resolution touch screen, four gigabytes of memory, a secure digital slot for added memory, a USB port, a wireless keyboard, a mouse, and a bluetooth-enabled, battery-powered inkjet printer. The concept of a “mobile office” that incorporates Web 2.0 capabilities is definitely compelling. If Ford rolls this feature out to other cars besides SUVs and trucks, the idea could really take off. For instance, it would be a great option for cars in rental fleets that are commonly used by business people who are on the go.